Oman is a very unique holiday destination for a number of reasons. Located next to the United Arab Emirates, there are very little similarities between Oman and somewhere like Dubai. This isn’t to say that Oman is a poor country, in fact Oman could be considered a relatively well off area. The local people simply place an emphasis on the importance of modesty and tradition. The culture of Oman is also very interesting. It strives to find a balance between honouring the old Omani traditions of the past with following Sultan Qaboos’ attempts to modernise the country. This can lead to curious situations for tourists, for example Oman has had female politicians for a few years now, yet in some parts of the country it is considered inappropriate for a man to smile at a woman. 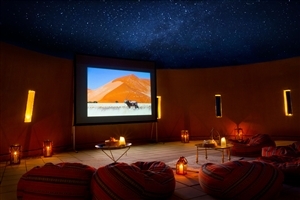 This may seem a bit daunting at first but it is here that the true appeal of Oman lies. While it is highly recommended that tourists should research the local culture beforehand so as not to accidentally cause any offence, this means that Oman provides a look into traditional Arab culture that hasn’t been warped by wealth and western influence like some of the Emirates have. Tourism has become the fastest growing sector in Oman and with this they have attempted to capitalise on the growing interest from visitors. This has lead to a number of luxurious hotels being built around the capital. They range from fairly cheap hotels to the absolute peak of luxury and we here at Travelbag have all the best deals for you. 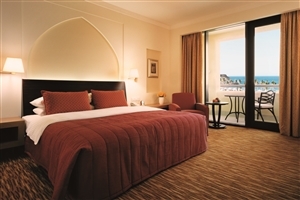 Oman has a range of lovely beach hotels to suit all budgets. Starting with the Al Bustan Palace near Muscat, this amazing hotel actually has the entire top floor permanently reserved for Sultan Qaboos. As the old saying goes, if it’s good enough for a Sultan, it’s good enough for you. 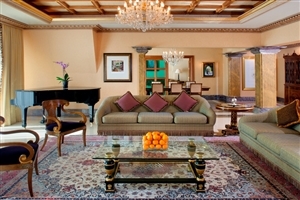 Not to worry, compared to hiring out an entire floor, the normal rooms make the Al Bustan a cheap Oman hotel by contrast. If the presence of Royalty intimidates you, why not try the Grand Hyatt, a no less regal establishment famous throughout the Middle East for it’s afternoon tea. But what if you want to go a step further than the Sultan? Well you’re in luck because we here at Travelbag are proud to bring you exclusive prices on the Six Senses Hideaway, considered by many to be the best of the best hotels in Oman. Watch a camel race. Camel and horse racing are both popular in Oman but there is more passion behind the raising of Camels. Visit Turtle Beach. If you time your visit right you may be able to witness the eggs hatch and see the babies make their way to the sea. Visit a fort. Oman has a rather military orientated history and most towns have their own ancient fort. Water Sports. As an area with a lot of beaches all of the usual watersports, like diving, fishing and boat rides are all popular in Oman. Whatever you choose to do with your time in Oman, book your 2019 or 2020 hotel stay with us today and make sure your accommodation is as memorable as the activities you enjoy while you’re there. Here is just a selection of our favourite and cheapest hotels in Oman. Please use our search panel above to find your perfect choice. 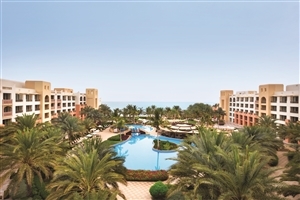 The largest of the three hotels located at the five-star Shangri-La Barr Al Jissah Resort on Oman’s unspoilt coastline, Al Waha is a dedicated family resort comprising of 262 guestrooms and suites. Meaning ‘The Oasis’, Al Waha reflects its moniker with its pretty grounds of lush gardens and refreshing swimming ... pools, while the traditional Dhofari architecture will leave you positively enchanted. Sharing facilities with Al Bandar and Al Husn, staying at Al Waha gives you the choice of 11 gourmet restaurants and a plethora of excellent amenities. Discover the Arabian jewel that is the Sultanate of Oman with a stay at the five-star Grand Hyatt, set on a pristine stretch of beach close to the capital city of Muscat. 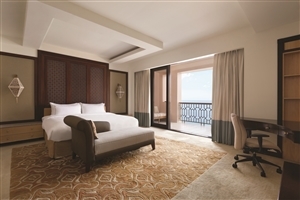 Overlooking the sparkling Gulf of Oman and fringed by a dramatic mountain backdrop, Grand Hyatt Muscat comprises of ... 280 elegantly-appointed guestrooms and suites, many of which enjoy spectacular vistas across the waters and the pleasant sands of Shatti Al Qurum beach. Ideal for an Oman holiday or business trip, Grand Hyatt Muscat features award-winning restaurants, a fitness centre and sporting facilities. Part of the spectacular five-star Shangri-La Barr Al Jissah Resort on Oman’s unspoilt coastline, Al Bandar – translated as ‘The Town’ - is inspired by old Muscat in its architecture and exquisite design touches. The entire resort’s focal point, Al Bandar is home to seven food and beverage outlets, 11 ... meeting rooms, 198 sea-facing guestrooms and suites, and the signature Barr Al Jissah Ballroom measuring 1056sqm. Facilities at Al Bandar include swimming pools, the Chi Spa and a Scuba Diving centre. A chic, minimalist retreat tucked into a splendidly secluded location on Oman’s coastline, The Chedi will take your breath away with its beauty and sophistication. Comprising of graceful, sharp buildings and villas decorated to five-star standards of quality and luxury, The Chedi will impress with its exquisite attention to detail, ... whether it’s the elegant chandelier in the lobby or the sublime infinity-edge swimming pool that appears to disappear into the horizon. Features at The Chedi include a large health spa and six fine-dining venues. 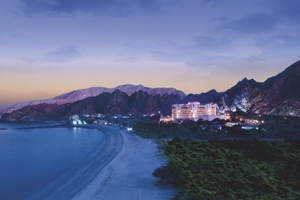 Uncover the gems of Oman with a stay at the lavish Al Bustan Palace, a Ritz-Carlton hotel set on its own stretch of pristine beach overlooking the Arabian Sea and surrounded by a dramatic mountain backdrop. Originally built to host the Gulf Co-operation Council in 1985, Al Bustan Palace has ... retained the same standards of luxury and quality that wowed esteemed guests first time around with its 250 elegant guestrooms and suites, tempting dining options and beautiful resort gardens. Nestled between one of Oman’s most pristine beaches and a tempting lagoon, the Al Baleed Resort Salalah by Anantara perfectly pairs opulent comforts with easy access to some of the hottest spots the area has to offer. Situated close to the Al Baleed Archaeological Park, those looking to explore should ... find this a great place to start, while those simply looking to relax and take in the soothing ambiance of the region should find the in-house dining venues, plush-filled accommodations and recreational facilities the perfect accompaniments to the perfect holiday. Part of the spectacular five-star Shangri-La Barr Al Jissah Resort on Oman’s unspoilt coastline, Al Husn Hotel is distinguished by its excellent standards of quality and luxury to ensure your stay is a memorable one. Features include some of the largest and most luxurious guestrooms and suites in Oman, while ... guests can also take advantage of the superb facilities available across the entire resort, including 11 gourmet restaurants and a private 100m stretch of pearlescent beach. 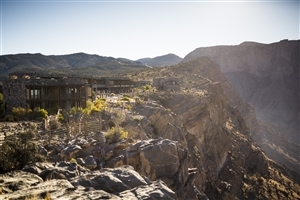 Delve deep into the history and culture of Oman while staying at the Alila Jabal Akhdar, a warm and welcoming getaway that is sure to entice any and all travellers. 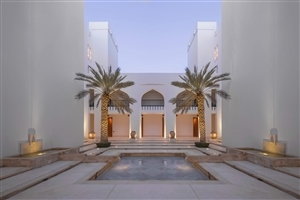 Designed with traditional Omani construction techniques combined with modern architecture, the resort is a unique escape that aims to impress ... with its visuals as well as its quality services. Whether you’re looking to ease back in your chosen accommodation, dine on local cuisine at the in-house dining venue or relax by the infinity pool, you’re bound to feel rejuvenated in no time, and for those looking to explore, the splendour of Oman is yours to discover. Perched atop a craggy canyon edge known as the Saiq Plateau in Oman’s scenic Green Mountain, the Anantara Al Jabal Al Akhdar Resort provides luxury and style for travellers looking to get up close and personal with the ancient forts and traditional markets the region has to offer. Playing host ... to 115 elegantly designed rooms and villas, the resort provides for a variety of traveller types and situations, and with the incredible in-house eateries to choose from along with a wealth of activities and facilities to be utilised, this Oman paradise is just the thing to attain that one, unforgettable holiday experience. Discover a hidden treasure with a stay at the magnificent Six Senses Zighy Bay, an award-winning Oman holiday resort on the northern Musandam Peninsula. Set on the pristine shores of Oman’s spectacular Zighy Bay, where sparkling waters stretch to the horizon and rocky mountaintops provide a dramatic backdrop, Six Senses ... Zighy Bay showcases beautiful indigenous village-style villas created to the highest standards of quality and offering an array of indulgent features, including private infinity-edge pools, spa treatment rooms and unforgettable views.